You’re maybe not going to believe this, but I got to meet someone special last week, who I had heard about. 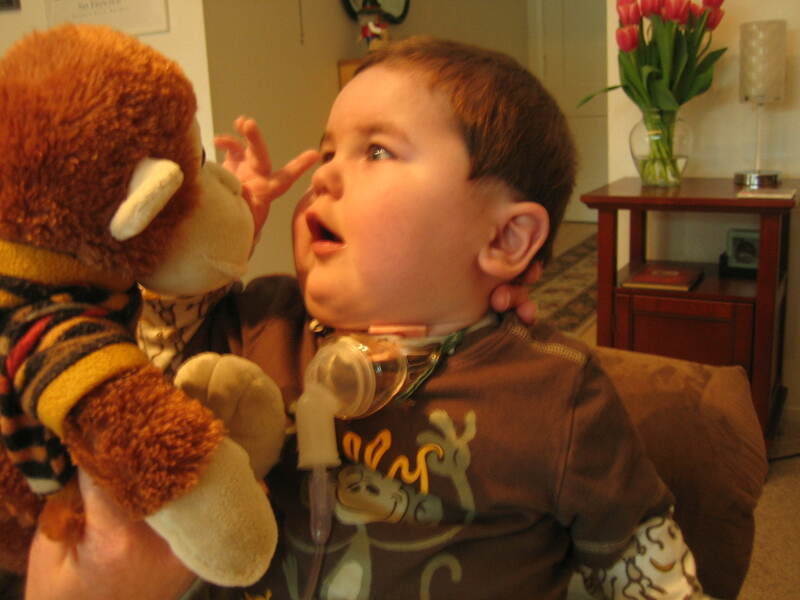 I learned about a little boy named Rudy, who has his own blog, called Rudy’s Beat, and who has some tricky things going on with his heart and lungs and such, and at first I didn’t understand it all. But the main thing I DID understand about him, was that he loves monkeys! 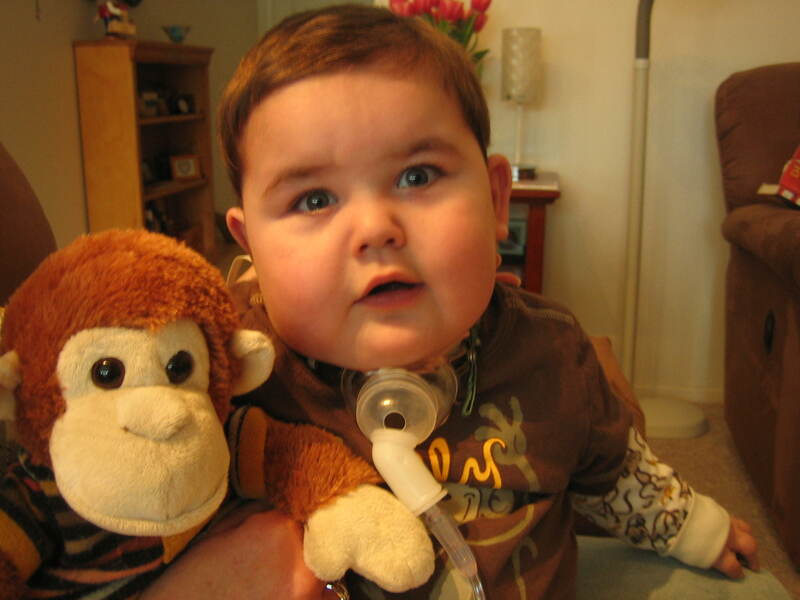 AND that he has a special friend, named Paci-Monkey who has a full time job as this little guy’s pacifier! I thought this was an amazing thing for a monkey to do, so I just had to meet them somehow. I got an invitation to go to Rudy’s house, and go on in and meet him and play with him myself. When I got there, things were sort of different than I had expected, and I didn’t know what to do! It turns out Rudy is not just a regular little guy. He is hooked up to a machine that makes some noises. And he can’t talk because there is a little hole in his throat for a sort of a slim hose, and when he laughs or cries, no sounds come out! I almost freaked out and had to go home, because I had never met anyone like this before. I hate to admit it, but I was sort of scared at first. I can't believe they just left me here with him! But the lady had given me a ride, and she and Rudy’s mom were laughing and talking like nothing was wrong. So I decided there must not be anything wrong, and I decided to see what I could see. Right away I got to meet Paci-Monkey, who told me all about Rudy. He told me about how Rudy was born with only one half of a heart, and that the doctors gave him a little in-between helper thing in his heart , so he can grow up and then later have another operation and hopefully he will be able to keep growing up all strong and big! 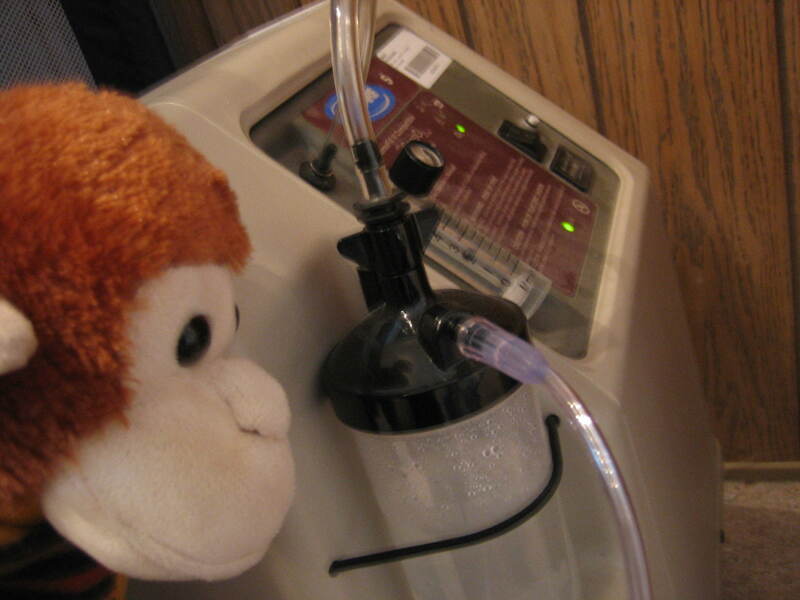 Paci-Monkey told me that the thin tube is oxygen, because he needs all he can get. 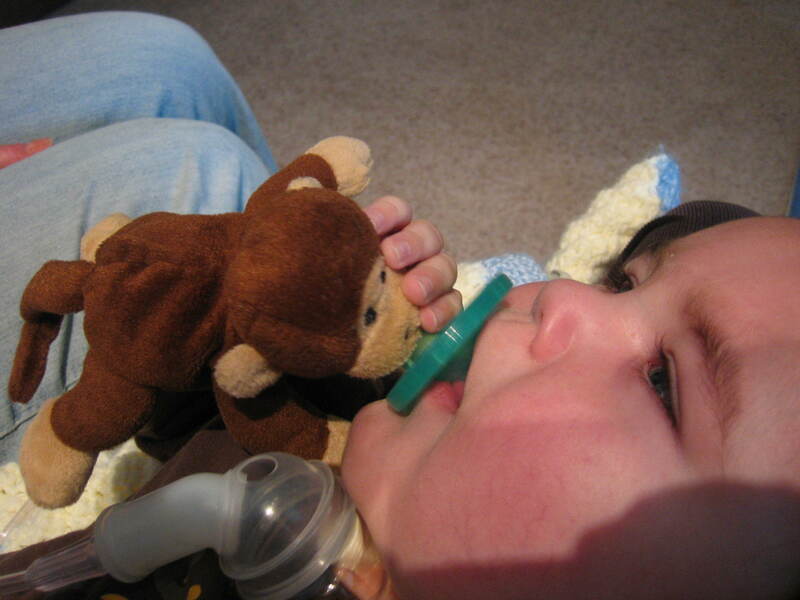 It sends good fresh oxygen right into his throat for him to breathe, through a tube in his trachea. 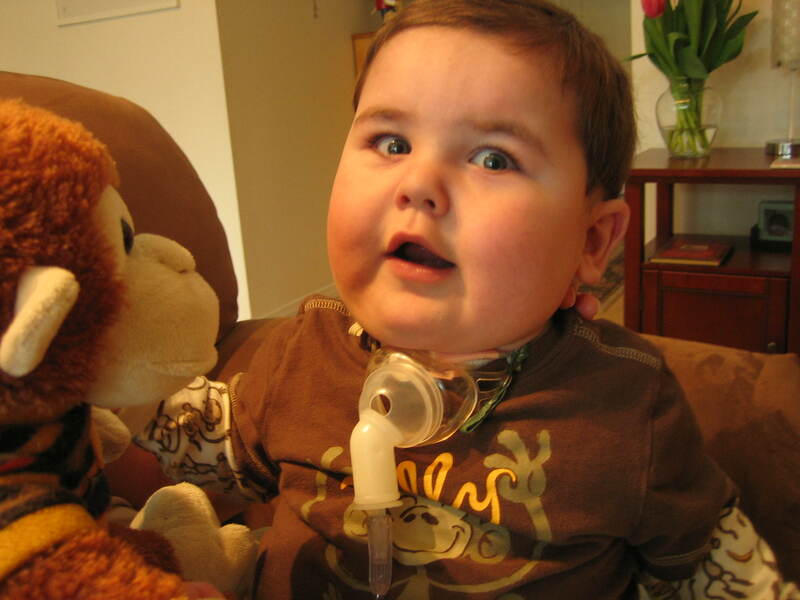 I snuck a peak at his trach. He can’t make sounds with his voice, but his smile and eyes do all the talking for him! 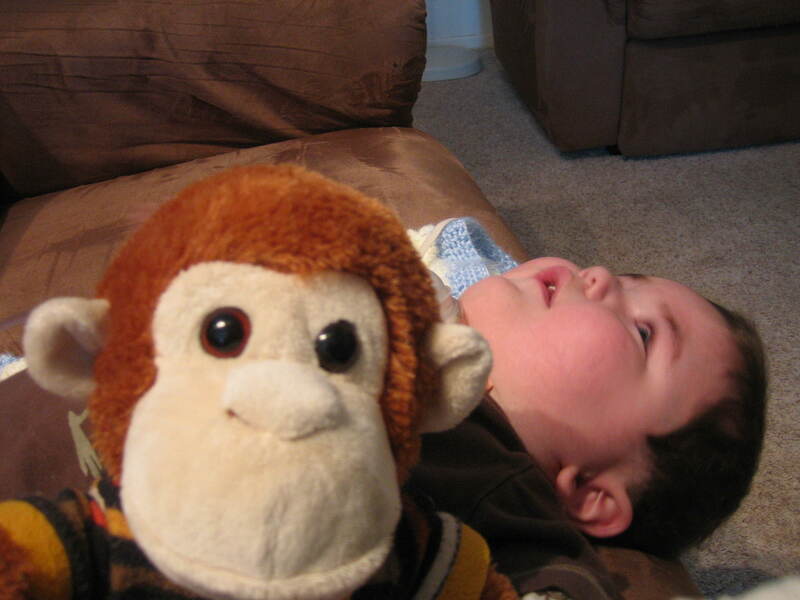 Paci-Monkey absolutely adores Rudy, and he showed me why. 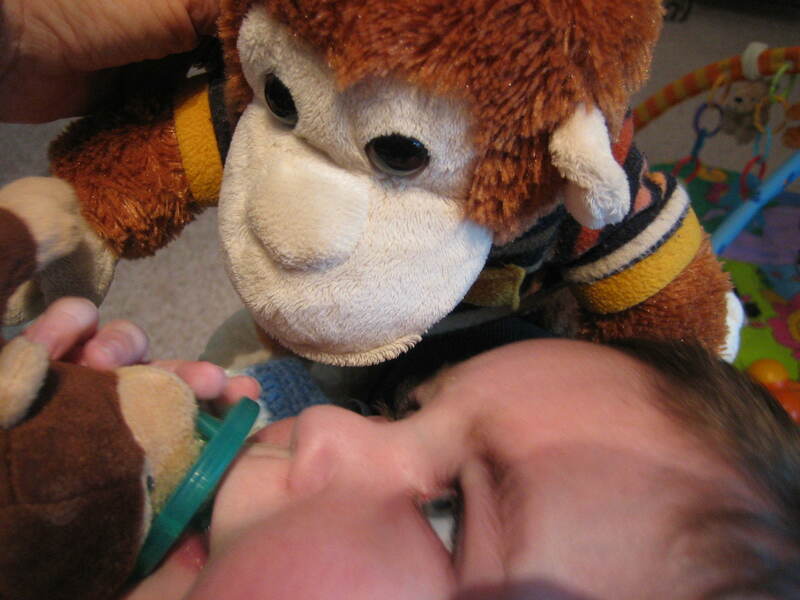 Paci-Monkey is easy for Rudy to hold, and he can grab on and jam the Pacifier in whenever he wants! 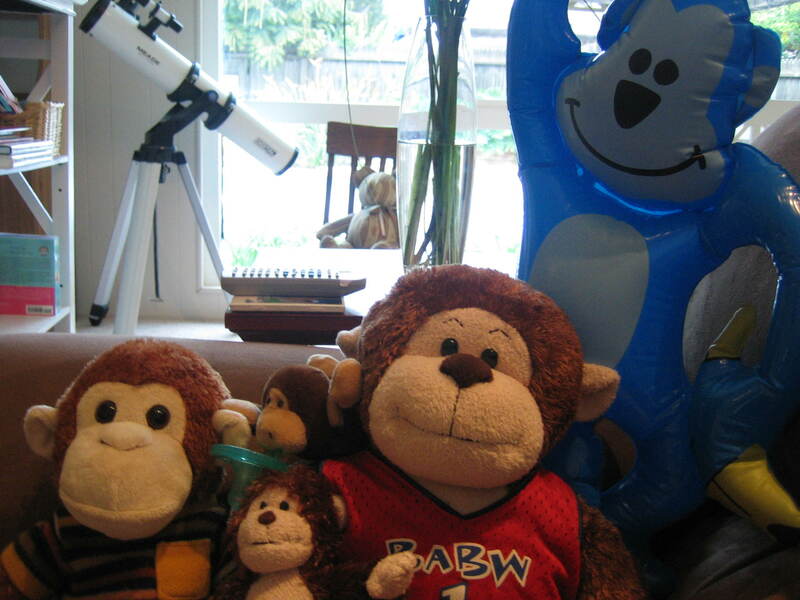 Paci-Monkey told me he would rather hang out with Rudy than eat bananas all day long! When our visit was about over, I couldn’t believe it, but they gave me a special present! A MONKEY friend to bring home and live with the rest of us! 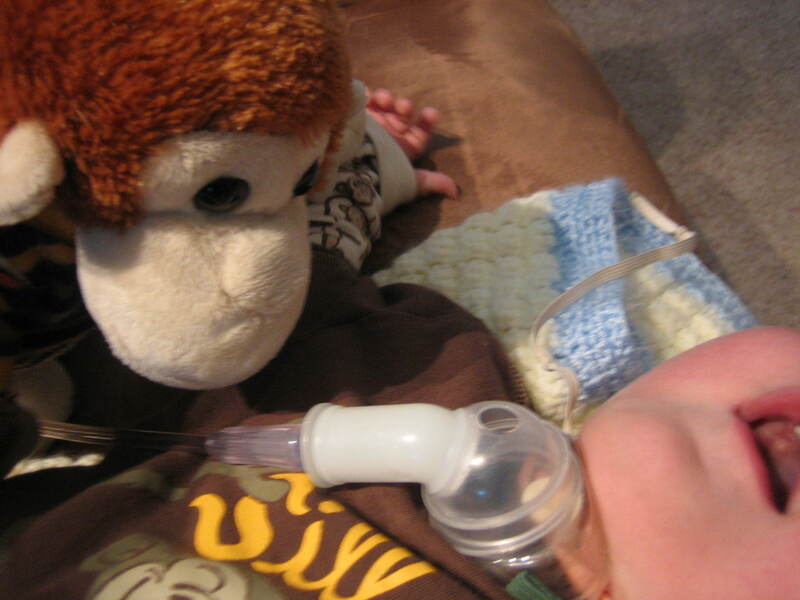 His name is Hospital Monkey, because he is exactly like the special kind of Monkey that will go with Rudy the next time he goes to the hospital. It’s because he is easy to clean and keep sterile, so no dirt or boogers germs get in the hospital room. So great to meet you, Hospital Monkey! We got to take a group photo of the other monkeys at Rudy’s house. I believe we are actually cousins. A crowd of monkeys is always a good time. I had such a good time. 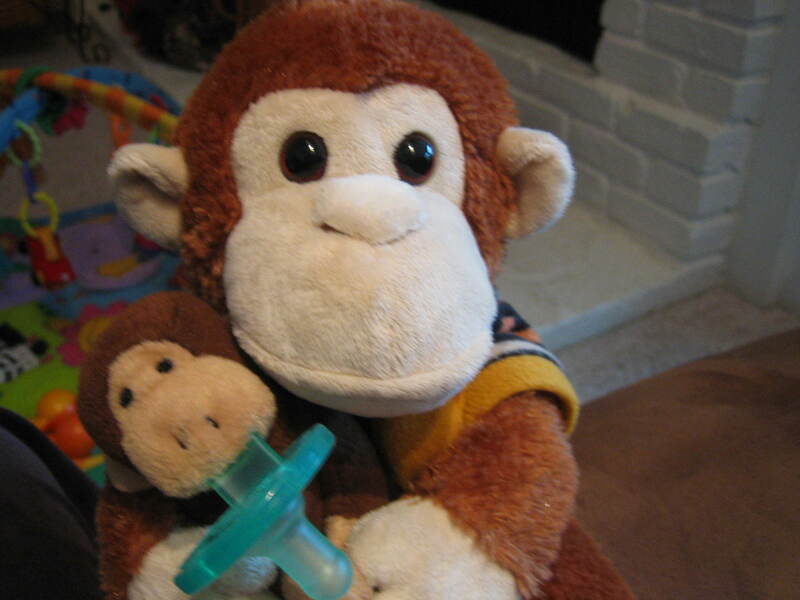 Now, just like Paci-Monkey, I love my good friend Rudy, too. It's official. We are friends. This entry was posted on March 8, 2010 at 10:26 pm and is filed under Uncategorized. You can follow any responses to this entry through the RSS 2.0 feed. You can leave a response, or trackback from your own site.